What would you do if your life was based around dangerously guarding someone your whole entire life with no exceptions? “They come first.” This is the quote Rose Hathaway lives by. After two years on the run, Rose has progressed on watching over her friend, Lissa. By that time, they are dragged back to their boarding school where they ran from. It’s not your regular kind of school. This one is all about teaching the protectors, and the ones being protected themselves. They will go through pain physically, mentally, and emotionally. With Strigoi on the loose, anything can happen from threats, to invasion of the school. What if your own family betrayed you? Uh-oh something’s going to go wrong…. 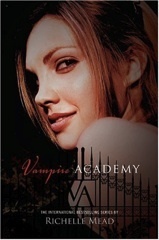 The WHS Library owns Vampire Academy.